ShiftMatch for Aged care - Utilise casual staff across sites. Instantly fill vacant shifts. Utilise staff across sites. ShiftMatch provides an automated casual staff booking solution for residential care facilities. Instantly deliver the most cost-effective, qualified staff to their preferred work time. ShiftMatch allows you to share nurses, carers, rehab and support staff across sites increasing staff utilisation. How will ShiftMatch make a difference? Nurse shortages are a widespread problem throughout the aged care industry, with the ageing population increasing staff demand. Here’s how our automated, trackable system will make a difference in managing staff shortfalls. Our cloud-based system can be used on any device, anywhere, at anytime – as long as there’s internet connection. The responsive interface allows staff to easily manage when and where they want to work, while managers have greater control and visibility over the roster. Managing vacancies is so much easier with ShiftMatch. Group staff by preference, location or speciality and filter by a variety of customised criteria, easing the search process. I already have a scheduling/rostering system – why do I need ShiftMatch too? After you post your Staff Roster, how do your managers replace vacancies and find staff for shortfalls? ShiftMatch gets managers off the phone by automating the filling of gaps in your Roster. We’re really busy – how hard is ShiftMatch to implement? ShiftMatch is ready to use in just a few days – configured with your workforce and scheduling practices – and is available anywhere via the web. We help you get your staff ready for the change and we train managers and schedulers in just a couple hours. Do we need a capital budget? Our customers easily pay for ShiftMatch from the savings in their overtime and agency budgets. As a software service, you only pay when you use ShiftMatch. There is an initial charge for configuration and training, and no long-term contracts or commitments. Does ShiftMatch integrate with our other workforce software? 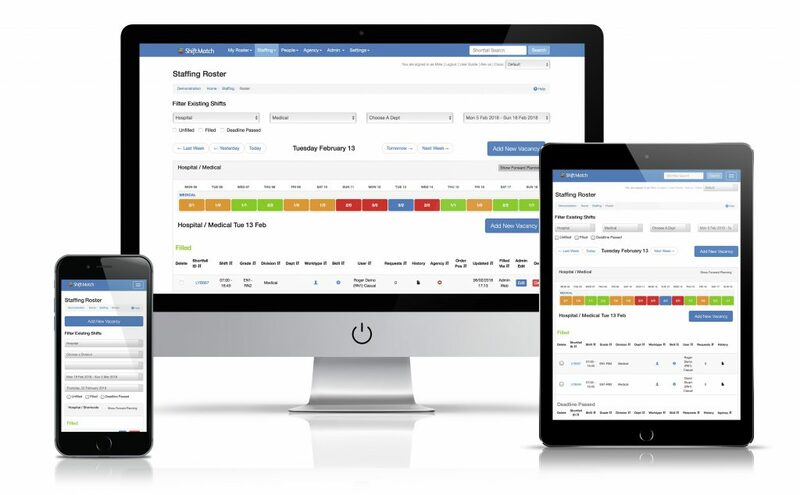 ShiftMatch includes a suite of industry standard API’s to connect to other workforce management software such as Scheduling, Time & Attendance, Payroll, Data Warehousing and Agency Staffing Allocation systems. Will my staff like ShiftMatch? Staff retention typically improves after ShiftMatch is implemented, because your workers feel more valued. Staff have greater control over their work/life balance able to pick up as much or as little work as they require and only get notified about the shifts they want. We care about your staffing needs. Our sophisticated system is a reflection of feedback from our users. We believe that our product will make a difference in your organisation and we’re here to help in any way we can. We offer the best support directly with our key personnel and provide userguides which are available to you 24/7.